I love it when I can make one thing and use it for several meals. These meatballs were meant to go into a southwestern meatball dish, but I was wiped out after a long day of work and a 10 mile run. By the time I finished mixing up the meatballs, I was done. I just couldn’t do anything more – I threw together a quick tomato sauce and cooked up a few meatballs for dinner and threw the rest of the meatballs into the fridge for later. Fair warning – this recipe makes a lot of meatballs. Like 5 dozen+ depending on how big you make them. But, don’t worry – they are super versatile and freeze beautifully! Preheat oven to 350°F. Lightly grease two large baking pans and set aside. In a large bowl, combine all ingredients and mix with hands until well incorporated, being careful not to over-mix. Roll into meatballs about 1 inch in diameter and place onto prepared baking pans about 1 inch apart. Bake in preheated oven for 20 – 25 minutes, or until meatballs are golden brown and reach an internal temperature of 165°F. 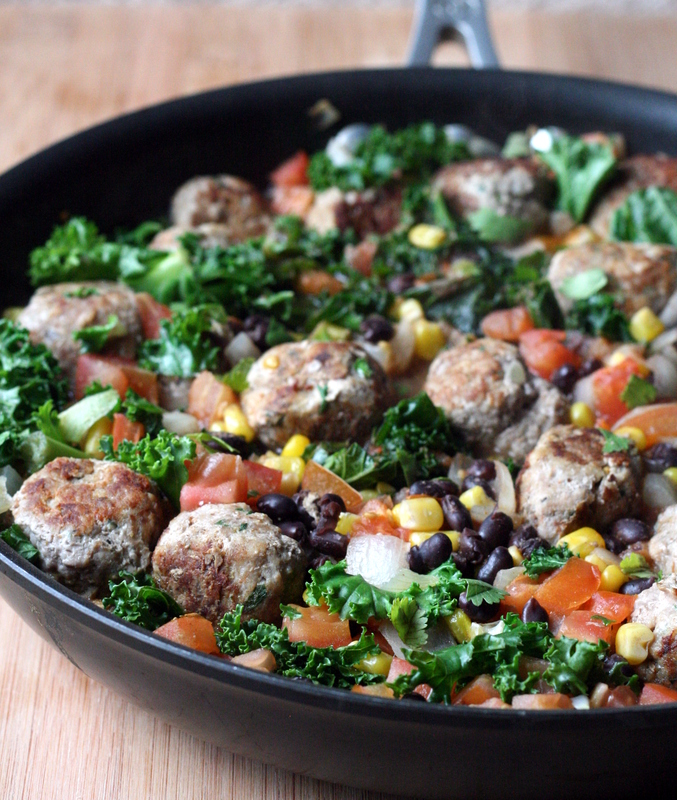 Use meatballs immediately, or lay on a baking sheet and place in the freezer. 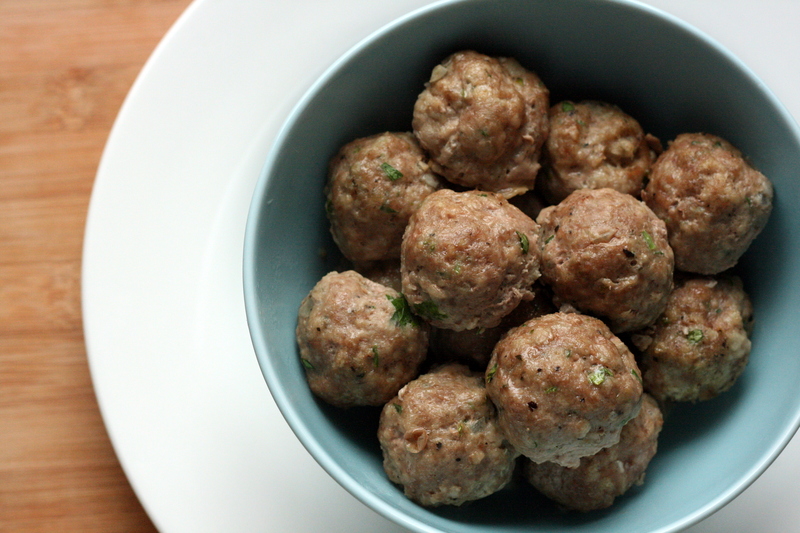 Once the meatballs are frozen, transfer to a freezer-safe bag or dish. Meatballs will keep for up to 2 months in the freezer. Categories: Dairy Free, Freezer Meals, Main Entrees, Meat, Money Matters, Quick & Easy, Special Diets, Turkey | Tags: dairy free, freezer meal, main dish, meat, quick and easy, turkey | Permalink. Soup is great for cold, snowy days. Soup is also good for men who have had their wisdom teeth out. Mike lived off of chocolate ice cream, chocolate pudding, and chocolate protein shakes for a day. Chocolate is good and all, but I’m pretty sure there is a limit to how much chocolate a person can consume. I decided to make some lasagna soup for Mike to try. I knew I could cook the veggies and noodles long enough to make them extra soft and manageable for my wisdom tooth-less husband. For me? I kept my noodles al dente. But I’m not dealing with major jaw pain and all. Since this soup doesn’t have cheese it’s really not much like lasagna at all. But hey, it was tasty and I didn’t really miss the cheese. But the lack of cheese and the use of a lower-fat turkey sausage versus a pork sausage means fewer fat and calories. 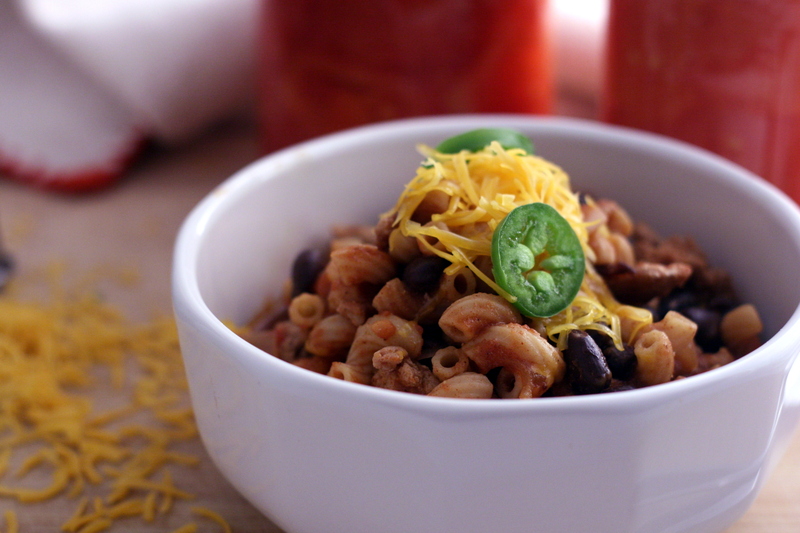 Tasty, healthy, and a perfect comfort food. Heat olive oil in a large pot or Dutch oven over medium-high heat. Add turkey break it into bite-sized pieces. 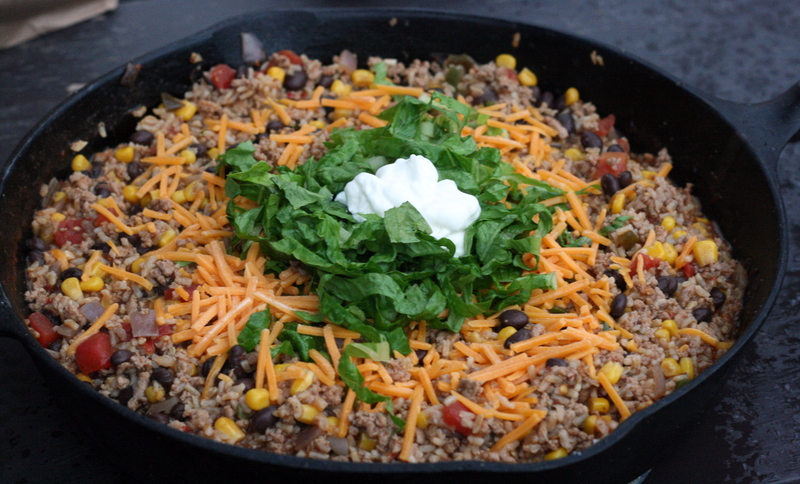 Cook until browned and cooked through, 4 – 6 minutes. Drain excess fat from pan. Add onions and garlic and cook until onions are translucent, about 5 minutes. Stir in broth, tomato sauce, diced tomatoes, bay leaves, red pepper flakes, oregano, basil, salt and pepper. Bring to a boil and reduce heat to a simmer. Let simmer for 15 minutes. Add in broken lasagna noodles and bell pepper and cook until pasta is al dente. Categories: Dairy Free, Main Entrees, Meat, Pasta, Quick & Easy, Soups, Stews & Chili, Special Diets, Turkey | Tags: dairy free, main dish, pasta, soup | Permalink. Thanksgiving is one of my favorite holidays. I am always with those that I love, surrounded by tons of good food. I’ll be honest – I really don’t like turkey that much. Thanksgiving meals are all about the side dishes to me. Stuffing, cranberry sauce, mashed potatoes, veggies… those are the dishes that take up prime real estate on my plate. Buried underneath all that goodness will be the smallest piece of turkey possible. 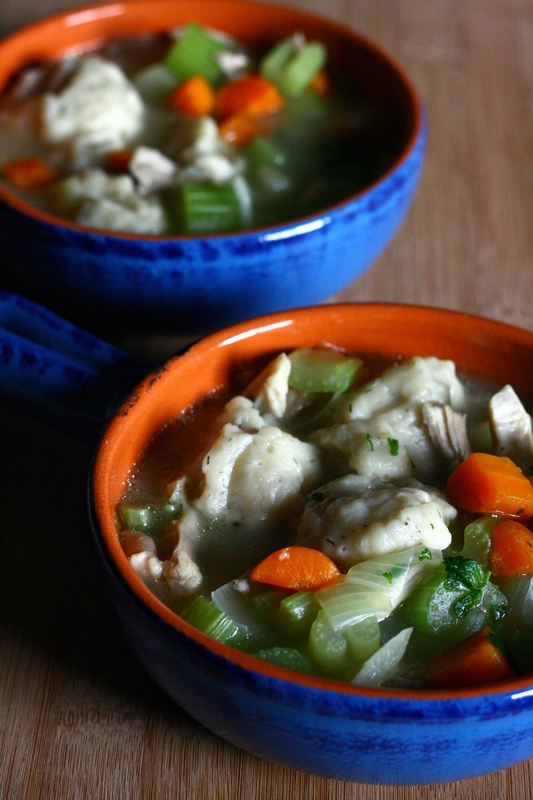 I actually made this chicken and dumpling soup a couple weeks ago after a business trip. During my trip, I ate a small-town family restaurant and got their chicken dumpling soup. It was pretty disappointing – watery with a million tasteless dumplings and no chicken whatsoever. When I finally got home, I had two things on my to-do list: 1) Give Mike a kiss and 2) Make some chicken dumpling soup. Let me tell you – this recipe was a million times better than the restaurant stuff. 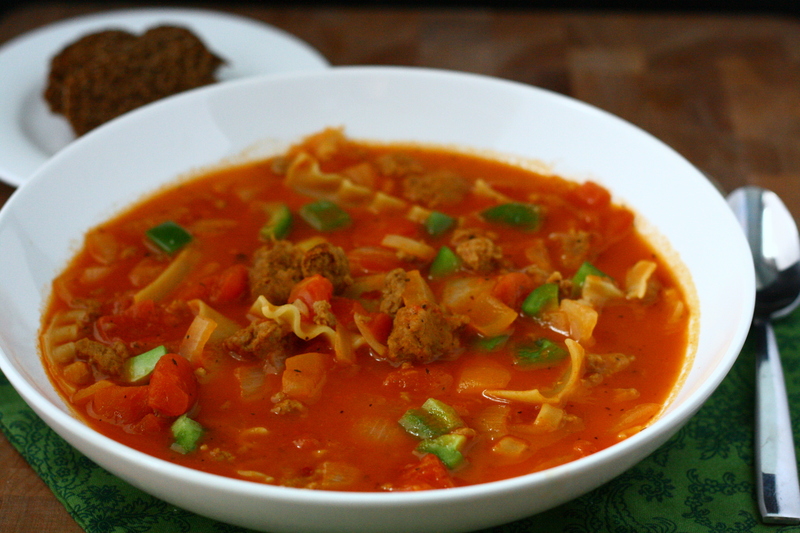 I’m hoping to make this soup again with leftover turkey – I imagine that the results would be just as tasty. Place chicken, broth and water in a large pot and bring to a boil over medium-high heat. Reduce heat to a simmer, cover, and cook until chicken is cooked all the way through. Remove chicken from the pot and set aside. When cool enough to handle, shred the chicken. Meanwhile, heat olive oil in a large pan over medium-high heat. Add in onion, garlic, celery and carrot. Cook, stirring occasionally, for 5 – 7 minutes, or until vegetables are tender. Transfer cooked vegetables into broth. In a small bowl, whisk together flour and 1/2 cup water until well combined. Whisk in ground mustard and thyme. Add mixture to broth and add in bay leaves and shredded chicken. Bring soup to a boil. Cover, reduce heat to a simmer, and cook for 15 minutes. While soup is simmering, make the dumplings: Whisk together flour, thyme, rosemary, salt, and pepper. Whisk in almond milk until combined. Once soup has cooked for 15 minutes, bring it back to a boil. Drop dumpling dough by tablespoons into the soup. Cover and simmer for 10 minutes or until dumplings are cooked through. Remove bay leaves before serving. Categories: Chicken, Dairy Free, Meat, Soups, Stews & Chili, Special Diets, Turkey | Tags: chicken, dairy free, soup | Permalink. I hope you all had a wonderful weekend. I know we did! Mike ran his first half marathon and I accompanied him as I ran my fourth. My husband, the man that detests running, laced up his shoes day after day after day to get ready for this race. I am so, so incredibly proud of him. I (lovingly) pushed him and we finished in 2:15. This was a full 15 minutes before our goal finish time (and a PR for me)! 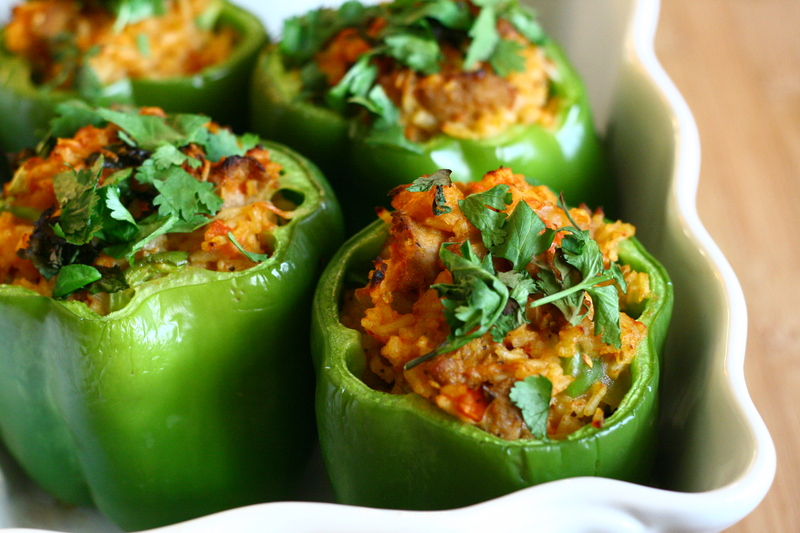 Ok, so on to these stuffed peppers. I was originally going to remake the last pre-race meal I had of sausage and bell peppers, but I changed my mind last minute and decided to make some stuffed peppers instead. These were easy to make and easy on my pre-race jittery stomach, too! Preheat oven to 425°F. Lightly spray a baking dish with olive oil and set aside. Cut tops off peppers and remove the core and seeds. Place them into prepared baking dish and set aside. Brown sausage in a large pan over medium-high heat. Use a spatula or wooden spoon to break the sausage up into crumbles. When sausage is browned, carefully drain off most of the grease. Add in onions and garlic and saute for 3 minutes. Add in red pepper flakes, garlic powder, paprika, oregano, pepper, tomato sauce and tomatoes. Stir to combine and bring to a simmer. Pour in chicken stock and rice and stir to combine. Bring to a simmer, cover, and cook until rice is tender, about 20 minutes. 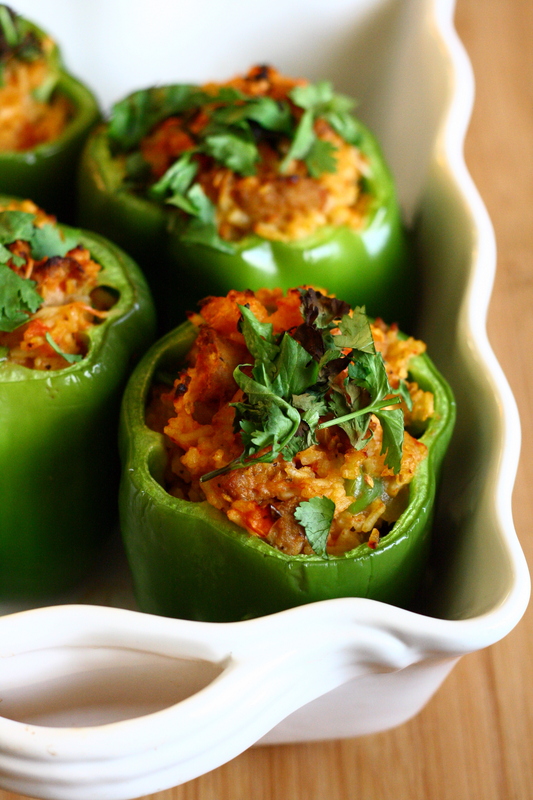 Remove pan from heat and spoon filling evenly into the 6 prepared bell peppers. Sprinkle with cilantro and cheese, if desired. Bake in preheated oven for 20 minutes or until heated through and cheese is melted and browned. Enjoy! Categories: Dairy Free, Gluten Free, Main Entrees, Meat, Rice, Special Diets, Turkey | Tags: dairy free, gluten free, main dish, turkey | Permalink.